Is A Bolted Safe Without A Monitored Alarm Safe? | Calgary Alarm Inc.
Safes are supposed to protect extremely valuable items, such as cash, jewellry and important documents from the threat of thieves, floods and fires. In theory, bolted safes are intended to increase security even more by bolting it to the floor, making it very difficult to be carried out by burglars. Considering the fact that there were 150,000 break and enters in Canada last year, now is the time to be seriously considering the safety of your home. 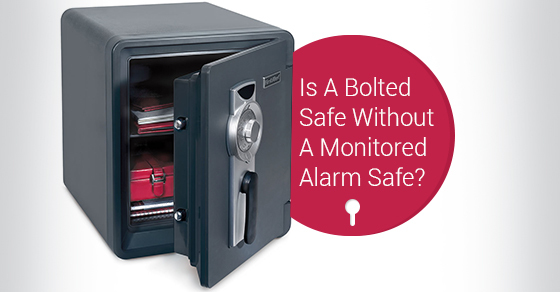 Even with the additional security measure of bolting down your safe, without a monitored alarm, it is not as safe as it could be. Your safe is still very vulnerable to being opened and/or carried out of your home. For example, thieves can use the tools from your garage (or even bring their own) and can easily break into the safe, even though it is bolted down. The time it takes to actually remove a safe is quite short. Moreover, even extremely heavy safes are not difficult to move. In fact, it is usually the fact that people are trying hard not to damage walls and other areas of the house that makes safes difficult to transport. When this is not a concern, the task becomes much easier. A monitored alarm, however, drastically reduces the time that burglars will have to break into the safe as the proper authorities are notified immediately that the safe is being tampered with. Without a monitored alarm, however, burglars have as much time as they need to enter it. How Can I Make My Safe More Secure? You can significantly reduce the chances that your safe will broken into if you invest in a monitored alarm, which will notify the authorities if your safe is broken into. In addition, keep in mind that large sums of money are always safest in the bank. It is also advised that you hide your valuables in different areas of your home instead of holding them all together in one spot. Ultimately, however, you can limit the risk of your home being targeted in the first place via a home security system. In the event that your home is targeted, the monitoring response centre is notified immediately and it contacts the appropriate authority to handle the situation quickly, minimizing damage. Many alarms will also offer you the ability to keep tabs on your home while you are away. Home security systems can significantly reduce your risk of having a potentially devastating event happen to you. The award-winning Calgary Alarm is one of the best security alarm monitoring companies in Canada, offering a range of high-quality and affordable alarms. Contact us today for more.